Empowering; mesmerising; clever; inspirational; beautiful; strong performance presence. Also – I need the soundtrack to Nicola Carter’s show in my life! ‘Lost in Labour’ is an art product created through the various work processes of a middle aged woman experiencing strange physical and mental menopausal symptoms. 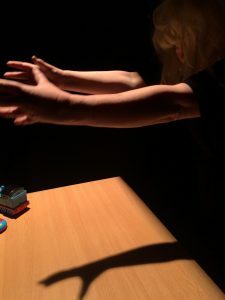 I explore and represent through movement, text and sound the culmination of a life engaged in various forms of work and labour and construct a performance experience in which I will ‘fake it to make it’. This performance is constructed from my body, my experience and my audience. It is spectacularly low key but you do get service with a smile. Lost in Labour’ explores the notion of the embodiment of labour in relation to identity and the current cultural and political climate. The performance addresses the following questions: what is labour and what is work? How do these concepts relate to the construction of ‘the self ‘. I aim to entertain, provoke and challenge the audience: sporadic weaving of movement, sound, music, props and text immerse the audience into the dramaturgy that at times makes them smile or even laugh. 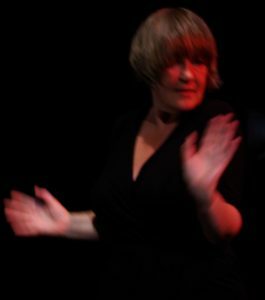 I am a middle aged menopausal woman that has constructed a performance using autobiographical confessions that are punctuated with spoken text lifted from adverts and work documents. The movement oscillates between gestures inspired by work and labour, the freedom of club dancing and codified contemporary dance whilst the music reflects my interest in film, nightclub and independent music culture; the lyrics reflect the themes of the performance. A clock ticking, the peeps and chugging from a moving children’s toy and the clunking sound of platform shoes contribute further to the sound score. 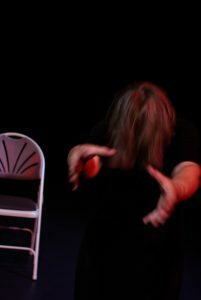 The audience are drawn into the ‘work’ through direct interaction with myself, the ‘worker’ (performer) and multi-layered manipulation of props including a table, a wig and a brush enhance the visual imagery and allow the audience to make association beyond performance to the everyday – work and play. The performance is a deconstructed striptease in which very slowly more and more of my middle aged body is revealed – where the impact of age, genetics and my past experience can be seen. Cover image by Heather Forknell. Artistic residencies: O Rumo do Fumo, Lisbon, Lake Studios, Berlin and Dance4, Nottingham.